Stir the dressing and coleslaw mix in a medium bowl. Let stand for 15 minutes. Stir the chicken and cayenne pepper sauce in another medium bowl. Divide the chicken mixture among the buns. Top each with about 1 tablespoon coleslaw mixture. 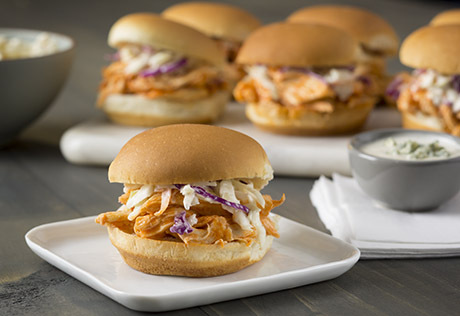 Easy Substitution: You can substitute Swanson® White Premium White Chunk Chicken Breast in Water, drained, for the shredded chicken in this recipe.